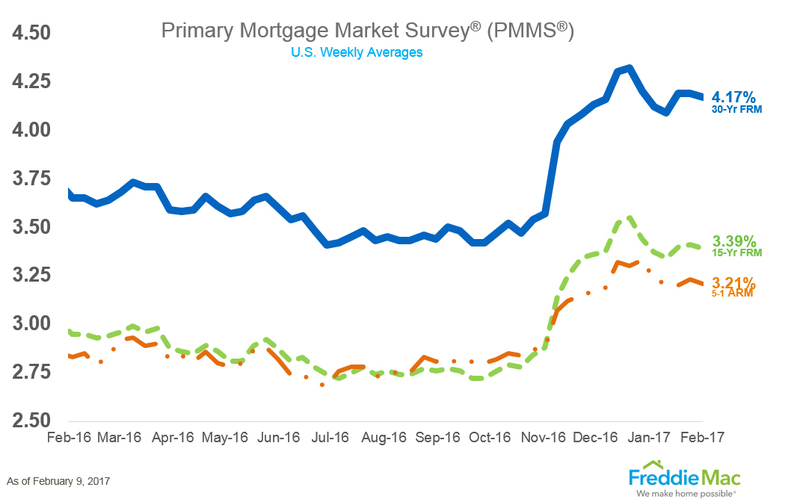 30-year fixed-rate mortgage (FRM) averaged 4.17 percent with an average 0.4 point for the week ending Feb. 9, 2017. This was down from last week when it averaged 4.19 percent. A year ago at this time, the 30-year FRM averaged 3.65 percent. The median existing single-family home price increased in 89 percent of measured markets, with 158 out of 178 metropolitan statistical areas (MSAs) showing sales price gains in the fourth quarter of 2016 compared with the fourth quarter of 2015. Twenty areas (11 percent) recorded lower median prices from a year earlier. An average of 87 percent of measured markets saw increasing home prices, up from the averages in 2015 (86 percent) and 2014 (75 percent). As of the end of 2016, there were 5.4 million (5,408,323) U.S. properties seriously underwater — where the combined loan amount secured by the property was at least 25 percent higher than the property’s estimated market value. This is a decrease of more than 1 million properties (1,028,058) from a year ago. The 5.4 million seriously underwater properties at the end of 2016 represented 9.6 percent of all U.S. properties with a mortgage, down from 10.8 percent at the end of Q3 2016 and down from 11.5 percent at the end of 2015. Mortgage applications increased 2.3 percent from one week earlier for the week ending February 3, 2017. The refinance share of mortgage activity decreased to 47.9 percent of total applications, its lowest level since June 2009, from 49.4 percent the previous week. The FHA share of total applications decreased to 11.9 percent from 12.1 percent the week prior. The HPSI increased by 2 percentage points to 82.7 in January. The HPSI is up 1.2 percentage points from January 2016. The net share of Americans who say it is a good time to buy a house fell by 3 percentage points to 29 percent, matching the survey low from May and September 2016. The net percentage of those who say it is a good time to sell rose by 2 percentage points to 15 percent. 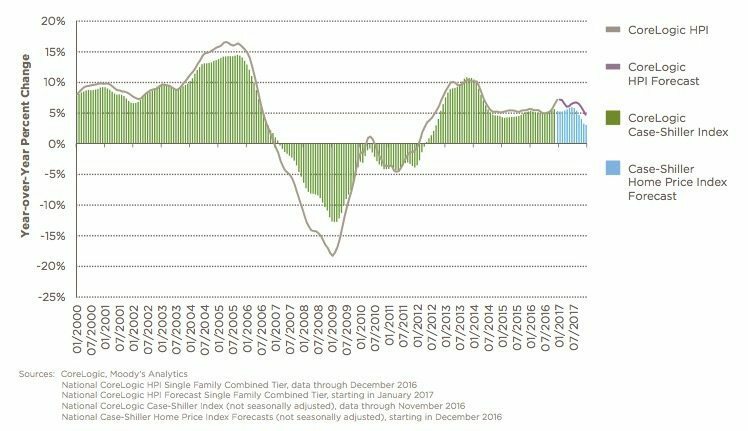 Home prices rose by 0.8 percent month-over-month in December 2016. They rose by 7.2 percent year-over-year. CoreLogic forecasts a 0.1 percent month-over-month and 4.7 percent year-over-year change. 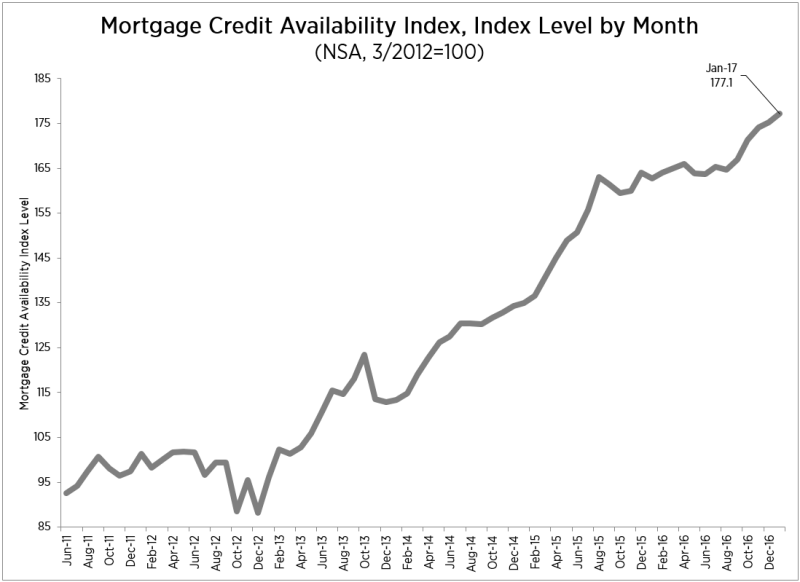 Mortgage credit availability increased in 1.1 percent to 177.1 in January. Of the four component indices, the Jumbo MCAI saw the greatest increase in availability over the month (up 4.7 percent), followed by the Conventional MCAI (up 2.3 percent), and the Government MCAI (up 0.2 percent). The Conforming MCAI decreased over the month (down 0.1 percent).